There are a number of benefits to using cartoons in teaching because they can: motivate students to engage with the lesson’s teaching point, arouse interest in a particular idea or topic grab and maintain attention. Barb Luhring is an excellent cartoonist! Her work can help you explain difficult concepts AND technology. How many times have you tried explaining technology to your audience or for your client? A picture is worth a thousand words and that’s exactly what Barb Luhring excels at! Web pioneer 3W Media needed tight visuals to help explain their 2017 hosting changes. 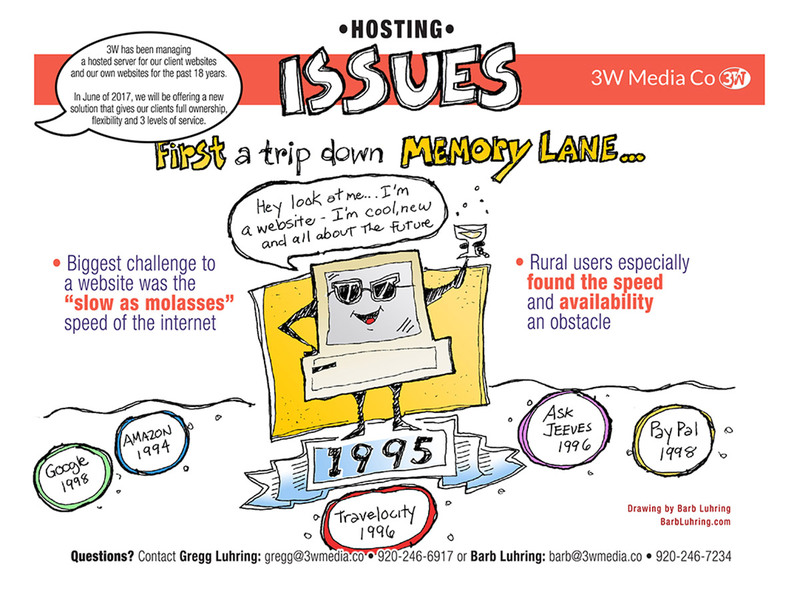 Two of the pages in the PDF highlighted the Web challenges they faced when 3W started offering services in 1995 vs. today’s challenges on across multiple platforms.